Update January 24: The Post and Courier's Robert Behre has done a fun piece chronicling the recent history and transformation of the 199 Saint Philip Street building which Hope and Union calls home. The house, originally built in 1885 has been a lot of things including a family home, a crack house, a boutique coffee shop, and most recently, the recipient of a Carolopolis award-winner from the Preservation Society of Charleston. First reporting: After going to Starbucks twice in one day this weekend, it was obvious that I needed a big change, especially since change was about all I had after going to the franchise coffee shop. Many times when they hand me my drink at Starbucks, I just stare at it, hoping that just maybe, if I stare long enough, it’ll grow to the size I expect for the price I paid. I honestly just wanted a place for free wifi, and didn’t feel like paying $4 for it at Starbucks. 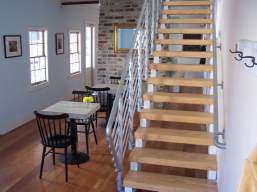 So to Twitter I went, and was recommended to a new coffee shop in Charleston, South Carolina called Hope and Union. Take everything you know about coffee shops and throw it out the window. No part of this Charleston coffee shop resembles that of your typical establishment. Visitors have to walk a few blocks from Charleston’s Historic District to find Hope and Union. Simply look for the coffee sign that hangs from the house, because if you’re looking for what looks like a coffee shop, you’ll never find it. Hope and Union blends in with the rest of the street, as it’s just a multi-story restored home. I walked up, stopped for a moment and muttered: “This is it?”. I honestly expected to walk up the ramp and through the doors and there just be no air conditioning. Yet this was only one of the many surprises. Part of the sitting area at Hope and Union. Have you ever walked into somewhere and just took this big sigh because it was such a breathe of fresh air. After walking out of 90-degree heat, I walked into a brightly lit, cool sitting area. It honestly felt more like a chic art gallery in L.A. that I had walked into. I was greeted with shiny hardwood floors, black and white photographs along the walls and a sleek staircase going up to the second floor. I walked through the main sitting area to the coffee bar and noticed another first: a sleek Macintosh computer, instead of a standard register. I was warmly greeted by one of the owners, Harper Poe, who gave me a rundown of what they offered, making a few recommendations, at which time I ordered a tea. Hope and Union’s coffee is brewed using the Chemex brewing method, which is handcrafted using carefully selected in-season coffee beans, offering a fresh, rich cup of coffee you won’t find at other chain places. The owner’s intentions are to reinvent the coffee houses of old that fostered community and intellectual thought. In my quest to find the perfect coffee house, there have always been elements that are missing. Hope and Union in Charleston, South Carolina takes all those elements, blending it together for the perfect combination of good eats and drinks, amidst a warm atmosphere.